While researching, today, I ran across a site devoted to Winston Churchill. A lot of the interest has been placed upon his American side which was through his mother, Jennie Jerome of Brooklyn. Winston's grandson, Winston S. (1940-2010) wrote of his genealogical interest being piqued (Churchill's American Heritage) while working on his volume, The Great Republic (1977). The article is not dated, but Winston S. does write of using ancestry.com, so it is fairly recent. 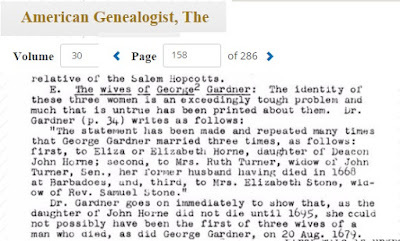 A later article examines some of the claims that had been made about the Churchill American ancestry (Mayflower Ancestry: The Case For and Against). Several things stand out. One is that interest generates research. Then, results need to be studied with publication following. The web has evolved into a nice place to do this, as we see with the website for the Churchill Centre. And, the family needs to be involved. The Thomas Gardner Society, Inc. offers that involvement and a commitment for sustaining the effort into the future. The current issue of Gardner's Beacon at the research interest and accomplishments for 2015. We provided material about Dr. Frank's paternal heritage: Benjamin Brown Gardner and Lucy Wilson Foster. Too, we are collecting information related to earlier work, pertaining to Gardner origins and relationships, which has spanned many decades. One descendant has proposed a nice conjecture about the Cape Ann experience which will be written in a post soon (link). See Vol. V, No. 2 of Gardner's Beacon for a review of research to date. 03/15/2019 -- Added image to the index on our portal to truth. As in, George, son of Thomas, and father of Ruth who was wife of John Hawthorne and ancestor of Nathaniel, the author. I pulled this image from the TAG (30, McCracken) article referenced by Anderson in his Great Migration write up about George. 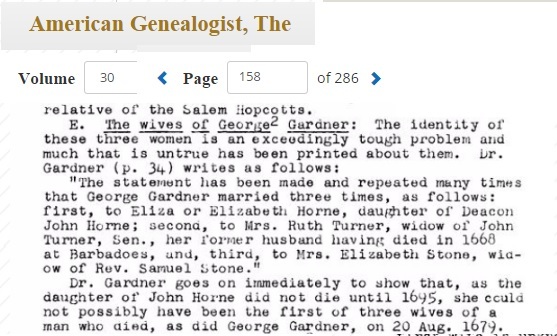 In that same TAG article, there was discussion of the wives of Thomas and the Shattuck family.